I watched a great old movie in the time period of the 1700s starring Anthony Quinn. A small village was brutally abused by an evil bandit and his army of thugs. Quinn organized and inspired the fearful villagers to fight back. When villagers were killed, many blamed, criticized and rejected Quinn. Displaying true leadership, Quinn remained willing to fight. He informed his critics that cowardice begets more tyranny. Freedom ain't free. Folks, true leaders pay a heavy price which is why they, as do eagles, fly alone. Sarah Palin has led by example, displaying tremendous courage, backbone and grit by standing up for conservative principles, traditional values, freedom and liberty; even when some conservatives and establishment Republicans joined the chorus of liberals, Democrats and MSM calling her a fool. Someone said if you promote a lie long enough, for some, it becomes reality. Such is the case regarding Palin's smarts. Meanwhile, Obama's list of faux pas including his recent inability to correctly spell “respect” are ignored or laughed-off. 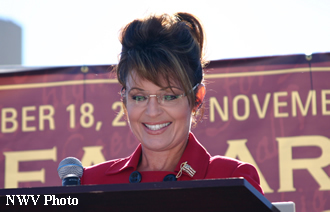 Threatened by her enormous presence and the extreme impact of her inspiring 2008 VP nomination acceptance speech, Democrats and the MSM immediately launched a campaign to destroy Palin. In their joint effort to discredit her, every word out of Palin's mouth has been viewed through an unjust false lens which assumes that she is an idiot. I challenge anyone on the planet to survive such extreme critical scrutiny. Sarah Palin is not perfect. She is a human being like the rest of us. But, Sarah Palin is an unmistakably gifted charismatic born leader who inspires millions to fight back against the horrible evil attempting to overtake our great nation. Palin's passion is fueled by her love for God, family and country and her knowledge that freedom ain't free. Thank God Palin is conservative. For those on our side who wish to nit-pic everything Palin says and does, I ask, what the heck are you thinking? Stop it! Obama and his vile minions (Lois Lerner and others) are launching daily unprecedented outrageous assaults on our freedoms. Why waste time, energy and resources beating up on one of our few generals leading the charge to restore America? As a proud conservative, I hold our leaders to a higher standard than the Democrats. I expect conservative leaders to make character driven decisions rooted in the best interest of the American people. However, I think it is unfair and foolish to demand that our leaders be perfect in every way. We should not join our enemies in berating them every time a conservative has a less than home run hitting media appearance. Our laser focus should be on exposing and stopping Obama's non-stop crimes against our Constitution. Attacking our own is counter productive. Despite the left's best efforts to silence her, Palin has been relentless, sounding the alarm of all the bad things that would accompany an Obama presidency. Palin was right. America's chickens have come home to roost for electing Obama. Here are Palin's predictions which have come true. Obama pacifying world aggressors would have negative consequences. Russia (which had just invaded the sovereign nation of Georgia, a U.S. ally) would feel emboldened to send troops in Ukraine as well. Under Obamacare there would be government “death panels” that would determine whether or not a patient should be eligible to receive life-saving treatments, or whether it would be cheaper to just let that patient die. Could you ever imagine such a thing in America? A few liberals have admitted that Palin was right when she said Obama does not have a whole lot of substance. Sarah Palin was right on all these issues. But the most important thing that Palin has been right about, winning her my utmost respect, is her unapologetic advocacy of true Conservatism; confidently touting Conservatism as the miracle cure for all of America's woes. The 2014 midterm election must be a vote for Conservatism. Conservatives in office is the only way we defeat our outlaw president and his army of thugs. We must take the House and the Senate. Palin's CPAC speech confirms that she continues to lead the charge. Her battle cry is loud, strong and clear. If the GOP wishes to repeat the victory it enjoyed in 2010, it had better embrace the Tea Party (Conservatism). I stand with Sarah Palin 100%. I pray you will do the same. As a proud conservative, I hold our leaders to a higher standard than the Democrats. I expect conservative leaders to make character driven decisions rooted in the best interest of the American people.